Over the past decade, a large number of strategies and technologies have been developed to reduce heart failure progression. Among these, cardiac tissue engineering is one of the most promising. Aim of this study is to develop a 3D scaffold to treat cardiac failure. A new three-block copolymer, obtained from δ-valerolactone and polyoxyethylene, was synthesised under high vacuum without catalyst. 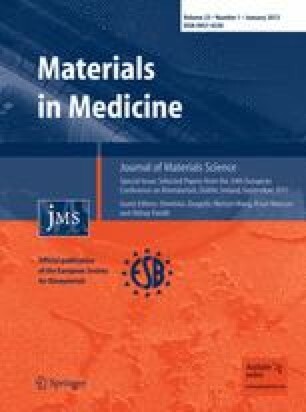 Copolymer/gelatine blends were microfabricated to obtain a ECM-like geometry. Structures were studied under morphological, mechanical, degradation and biological aspects. To prevent left ventricular remodelling, constructs were biofunctionalises with molecularly imprinted nanoparticles towards the matrix metalloproteinase MMP-9. Results showed that materials are able to reproduce the ECM structure with high resolution, mechanical properties were in the order of MPa similar to those of the native myocardium and cell viability was verified. Nanoparticles showed the capability to rebind MMP-9 (specific rebinding 18.67) and to be permanently immobilised on the scaffold surface. Authors would acknowledge Dr. F. Boccafoschi (University of Eastern Piedmont “Amedeo Avogadro”, Novara, Italy) for cytotoxicity tests and Dr. T. Prescimone (Institute of Clinical Physiology, National Research Council, Pisa, Italy) for zymography analysis. This work was financially supported by Italian Ministry of University and Research PRIN-2008 grant (Bioartificial stem cell niches for cardiac tissue engineering, 2010–2012). Wang PY, Yu J, Lin JH, Tsai WB. Modulation of alignment, elongation and contraction of cardiomyocytes through a combination of nanotopography and rigidity of substrates. Acta Biomater. 2011. doi: 10.1016/j.actbio.2011.05.021.